When things don’t work out one thing that you can say is that your tried. To try is more important than anything else. There will be a lot of things that you will not “succeed” at, but when you keep trying you are guaranteed to succeed a little bit more (or a lot more) than you would just sitting on your couch. The comfort in sitting on your couch is that you will never have to say that you failed. On the other hand, you will also be able to say that you never really tried. Try, try, try. Just keep trying. Something is bound to work out. The focus is more on the trying and having fun trying. 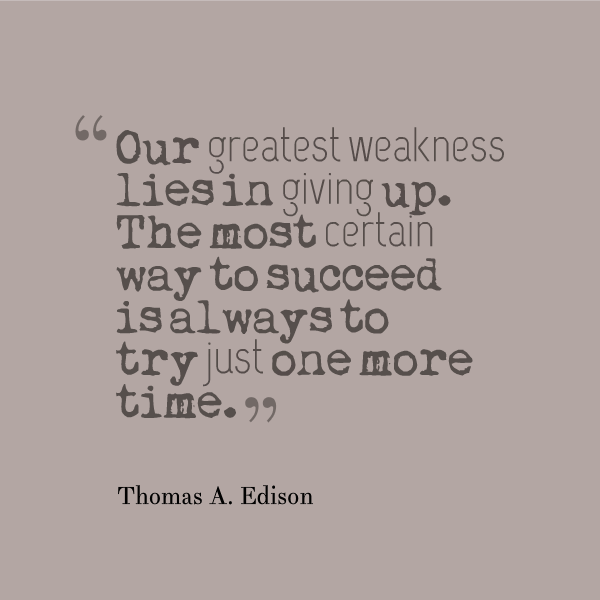 Many successful men and women tried several times (sometimes several hundred times) until they succeeded. But at least they tried. Try new things each and every day without judging the amount of “success” gained for it is more important to try than this perception of success. This entry was posted in Messages from Jesus, Success Series and tagged Postaday, Success. Bookmark the permalink.